How To Take Screenshot With Moto G? If you have ever wanted to save what is on your Moto G’s screen but didn’t know how. Here we will show you how to do that. Many of you may know how to do this already. 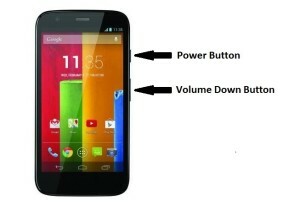 Press and hold both the POWER BUTTON and VOLUME DOWN BUTTON for a couple of seconds, or until you hear the camera shutter click or see an on-screen flash. Thats It!! you’re done. To view the screen image, touch Apps and go to Gallery > Screenshots. If you press and hold the image you will get some sharing options, which will appear at the bottom of the screen.